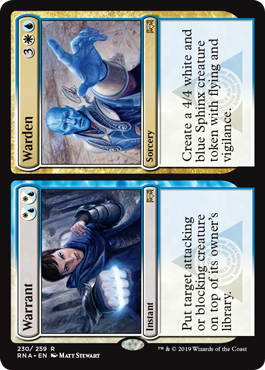 So one half is the best part of Azorius Charm with more flexible mana and the other side is a win condition. Yeah, this card might be a thing. At least a limited win condition. But it is a more multicolor-friendly Serra Angel (or Serra Sphinx), yes. I agree that the first half makes this card incredibly playable, outbid be surprised if the back half gets too much action. I appreciate when control decks have a win condition beyond "frustrate opponent into scooping" or "take half an hour playing mostly solitaire magic to gradually exile your whole deck"
I expect that this card will see play in decks with low creature counts (Jeskai/Turbofog/Azorius Control/etc). In such an environment, having that second mode to provide a secondary win condition can be a godsend against less ideal matchups (such as if your Karns/Teferis are answered). Likewise, it's a pretty good feature for game one if you end up in a match against decks with low creature counts. I'm not saying that the second half is "the good half". I'm just saying that it may have more utility than it first appears.